Threadripper system with air cooling? | be quiet! Installation: Dark Rock Pro TR4 (Threadripper) | be quiet! 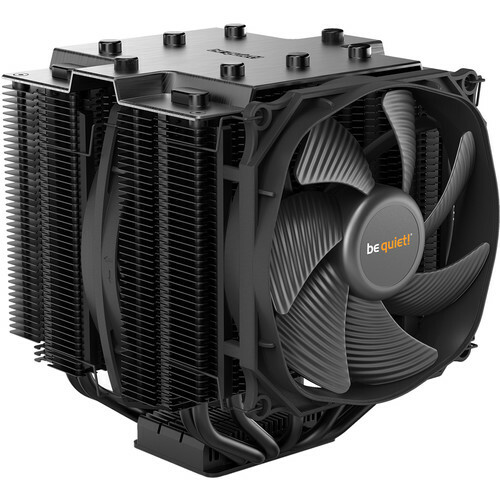 Keep your AMD processor cool while keeping fan noise to a minimum with the Dark Rock Pro TR4 Computer CPU Air Cooler from be quiet!. Designed exclusively for AMD TR4 sockets, the Dark Rock Pro TR4 is rated to cool up to 250W TDP processors. The cooler's 135mm and 120mm PWM fans are designed for quiet operation, and an optional third 120mm fan can also be mounted. Seven 6mm copper heat pipes help to boost heat conductance, while the two aluminum heat sinks are designed to further improve cooling performance. The two Silent Wings PWM fans feature advanced fluid-dynamic bearings, smooth six-pole motors, and airflow-optimized fan blades. The front Silent Wings 3 fan provides high air pressure thanks to a funnel-shaped air inlet in the frame. A decoupled fan mounting features vibration-isolating elements on the heat sink. Dark Rock Pro TR4 is equipped with seven 6mm copper heat pipes that help to optimize heat conductance. Airflow-optimized, wave-contoured cooling fins with small dots on their surfaces are designed to increase air circulation. The special black coating with ceramic particles helps to further boost heat transfer. Dark Rock Pro TR4 contains two aluminum heat sinks. The cutouts provided enhance its RAM compatibility. Two fans are pre-installed. It is also possible to add another 120mm fan for even better cooling. The mounting kit for the Dark Rock Pro TR4 cooler is completely black, ideal matching the black design of the cooler itself. You can conveniently install the cooler on the motherboard from above. The brushed-aluminum top cover with its diamond-cut finish adds a touch of elegance to this high-end cooler. Box Dimensions (LxWxH) 13.0 x 8.1 x 6.9"